i. A person who is a local to Andhra Pradesh State and also working in Andhra Pradesh Police Department as on the date of notification, has been on duty as Home Guard for a minimum duration of 360 days within a period of two years and who is still continuing his service as Home Guard, must have attained the age of 18 years and must not have attained the age of 32 years as on 1st July, 2018 i.e., must have been born not earlier than 2nd July, 1986 and not later than 15th July, 2000. (ii) All other candidates must have attained the age of 18 years and must not have attained the age of 24 years as on 1st July, 2018 i.e., must have been born not earlier than 2nd July, 1994 and not later than 1st July, 2000. Recruitment for the posts of SCT Sis (Civil) (Men & Women), SCT RSIs (AR) f Men & Women), SCT RSIs (APSP) (Men) in Police Dept., Dy.Jailors IMen) & Dy.Jailors (Women) in Prisons and Correctional Services Dept., and Station Fire Officers (Men) in A.P. Fire & Emergency Services Dept. Must have attained the age of 21 years and must not have attained the age of 27 years as on 1st July, 2018 i.e., must have been born not earlier than 2nd July, 1991 and not later than 1st July, 1997. Must have attained the age of 21 years and must not have attained the age of 32 years as on 1st July, 2018 i.e., must have been born not earlier than 2nd July, 1986 and not later than 1st July, 1997. Must have attained the age of 18 years and must not have attained the age of 32 years as on 1st July, 2018 i.e., must have been born not earlier than 2nd July, 1986 and not later than 1st July, 2000. G.O.Ms.No.382, Dated:17-10-2016:: Govt Of AP, GAD, Public Services - Direct Recruitment - Raising of upper age limit by 2 years for Uniform services for the ensuing Direct recruitments through Public Service Commission and other Recruiting Agencies - Orders - Issued. Accordingly, the following notification will be published in the A.P. Gazette. In exercise of the powers conferred by the proviso to Article 309 of the Constitution of India and of all other powers hereunto enabling, the Governor of Andhra Pradesh hereby makes the following Adhoc Rule. Notwithstanding anything contained in the A.P. State & Subordinate Service Rules, 1996 or in the Special Rules or in the Adhoc Rules for any State service or Subordinate service for Uniform services to be notified by the A.P. Public Service Commission and other Recruiting Agencies (other than those to be notified by the Police Recruitment Board) the upper age limit prescribed in relevant rules is increased by two years. This is valid up to 30.09.2017. Age concession over and above the upper age limit shall also be allowed to the categories as provided under Rule 12 of the A.P. State and Subordinate Service Rules, 1996. G.O.Ms.No.103 Dated:09-09-2016; GOVERNMENT OF ANDHRA PRADESH, HOME (LEGAL.II) DEPARTMENT, PUBLIC SERVICES - Direct Recruitment - Raising of upper age limit by 2 years for the ensuing recruitments through State Level Police Recruitment Board, Andhra Pradesh - Orders – Issued. 1. G.O.Ms.No. 315, Home (Police. C) Dept., dated. 13-10-1999 and amendments issued from time to time. 2. From the Director General of Police, Andhra Pradesh, Hyderabad, Lr No. 186/Rect.1/2016, dt.06 -07-2016. A number of representations have been received from unemployed youth and also from the Public representatives for considering relaxation of upper age limit for direct recruitment in Police department to enable more un-employed youth to become eligible to compete in the recruitment process of State Level Police Recruitment Board, Andhra Pradesh. 2. The Director General of Police, Andhra Pradesh, Hyderabad vide letter 2nd read above, has submitted his recommendations for raising the upper age limit for direct recruitment in Police department, Special Protection Force, Fire Services and Prisons department done by State Level Police Recruitment Board, Andhra Pradesh. 3. 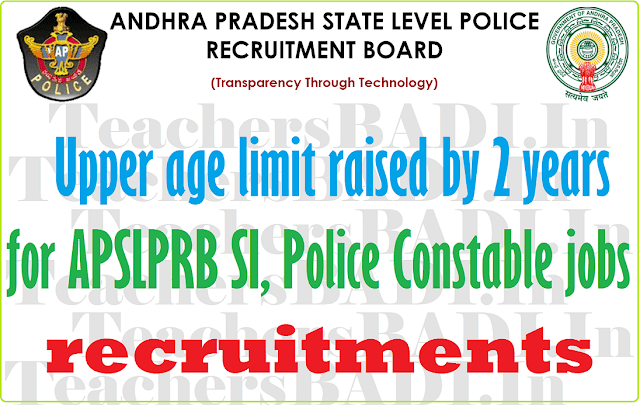 Government after careful examination of the matter, hereby decided to raise the upper age limit by 2 years for the direct recruitments in Police Department posts being done by State Level Police Recruitment Board, Andhra Pradesh through Notifications issued in the year 2016. 4. Accordingly, the following notification shall be published in the Andhra Pradesh Gazette. Notwithstanding anything contained in the Special or Adhoc rules for the recruitment in Police department, the maximum age limit prescribed in the said rules for appointment by direct recruitment shall be raised by (2) years for all direct recruitments in Police department being done by State Level Police Recruitment Board, Andhra Pradesh through Notifications issued in the year 2016 (i.e. upto 31.12.2016).